In 1947 Thor Heyerdahal and a group of friends made headlines all over the world by sailing a balsa wood raft from South America. They traveled over 4,000 miles before the raft was wrecked on a coral reef. This was the famous Kon-Tiki Expedition and for the majority of the public it was only a big adventure or publicity stunt. Yet this expedition did have a serious scientific purpose. The Pacific Ocean is by far the largest ocean in the world, taking up nearly half of the surface of the Earth, and what is surprising is that Stone-Age people have settled nearly every island in that ocean. Even on islands that are uninhabited there are signs of previous habitation. What is more, it seems that the Polynesians who inhabit most of these islands sailed and navigated their way all over the Pacific Ocean using primitive canoes. European academics have formed theories about where the Polynesians originated and it was assumed that they come from South East Asia. Thor Heyerdahal disagreed with this, pointing out that to do this these ancient sailors would have to sail against all the prevailing winds and currents. This is certainly what the Spanish had to do when they ruled the Pacific. The only way they could go from South East Asia to the Polynesian islands was to follow the prevailing winds and go right around the Pacific. They had to go north past Japan, Siberia, and then across to Alaska and Canada, then sail down the North West coast of America until they hit the prevailing winds blowing west. For this reason, Heyerdahal thought it was more reasonable to believe that the original inhabitants of the Pacific Ocean islands came from America. This itself is a controversial point, because it seems that the Polynesians may not have been the first inhabitants of the Pacific. Thor Heyerdahal claimed that the first inhabitants of both America and the Pacific island were white people, who were later overrun by Mongolian people from Asia. When he proposed this, other academics made the point that the Native Americans didn’t have any sort of sailing craft good enough to make such a voyage. 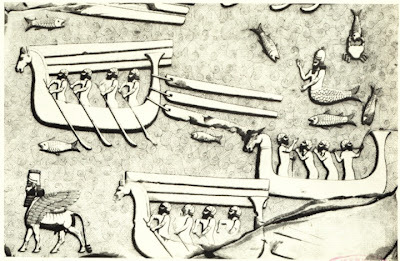 Thor Heyerdahal disagreed and pointed to the balsa sailing rafts that South American Indians were using right up until the end of the 19th century. But he wasn’t taken seriously, as these rafts were considered so primitive that no one in their right mind would want to sail across the Pacific in one. So to prove his point Thor Heyerdahal decided to build one and sail it across the Pacific himself. He didn’t get right across the Pacific but he did sail it 4,000 miles before it was smashed on a reef. Subsequent experiments by Heyerdahl and others have demonstrated that by manipulating the raft's several centreboards, an amazing degree of maneuverability is possible. It’s even possible to sail the raft upwind. Other people have since emulated this voyage and one expedition in the 1960s, sailed a balsa raft all the way from South America to Australia. Now the fact that a very basic and primitive craft like a sailing raft could be sailed successfully right across the biggest ocean in the world, creates a problem for scientific dogma. This is because this dogma states that sailing craft that can sail across oceans is a comparatively recent technology. After all, we are told, the first man to sail across the Atlantic to America was Christopher Columbus in 1492, which was just over 500 years ago. The fact that the Vikings did the same thing 500 years earlier in open boats is ignored. In the Viking sagas it was claimed that Bjarni Herjulfesson discovered a new land, in 986, which was later called Vineland. He was sailing to Greenland, but was driven far southwest by bad weather. He sighted unfamiliar coasts but without landing anywhere he turned back out to sea and eventually reached Greenland. With this news other expeditions followed, and settlements were constructed. But modern historians in the 19th and 20th century disputed this claim, casting doubt on the whole story. This dented the national pride of Scandinavian countries, and in the1960s a Norwegian scholar, Helge Ingstad, through painstaking research of the Viking Sagas managed to pinpoint where he thought they had settled in Newfoundland. His research proved to be correct, as signs of possible settlement were discovered on the surface. Then under the direction of archaeologist Anne Stein Ingstad a Viking settlement was unearthed, proving that the Vikings did sail to America 500 years before Columbus. Carbon dating on the site showed that this settlement was as old as the Viking Sagas said it was. So the Viking claim had to be acknowledged by the academic world but even more controversial are the claims made about the Phoenicians. It is well known that the Phoenicians were the seafarers of the ancient world, and it has been accepted that they did sail around Africa. This came from the Greek historian Herodotus, in 600 BC where he wrote that the Egyptian Pharaoh Necho hired a Phoenician fleet to circumnavigate Africa, from the Red Sea around the Cape of Good Hope and up the West African coast to the Mediterranean. It took them three years to do this and the reason why they took so long was they stopped each autumn to plant crops and would harvest them before the fleet set sail again. Now this is a slightly fantastic story because to do this they would need to find a harbour to shelter their ships, or drag their boats out of the water onto the beach to protect them from storms. They then would have to clear land and sow it and then wait around for the crops to grow to harvest it. Also the Phoenicians were not known as a farming people, so perhaps this could be a cover story, invented by the Phoenicians. The Phoenicians were secretive people and didn't reveal to outsiders with whom they traded. They also wouldn't want to other people to know how quickly it was possible to sail around Africa, in case other nations try to do the same and become competitors to the Phoenicians for trade. So by taking their time allowed them to claim it was a long and difficult journey. It is known that the Phoenicians sailed out of the straits of Gibraltar and had settlements along the Moroccan coast. They also sailed north to Britain and traded for tin in Cornwall. So did they cross the Atlantic and trade with the Native American people? The official line is that they certainly didn’t do this, which is a bit strange. Crossing the Atlantic is not a big deal. In the 20th century all sorts of weird and wonderful craft have made it across. People have sailed boats across less than 11 feet long, many people have rowed all the way in open boats, wind surfers have sailed across; someone even made it in a amphibious jeep! A Frenchman in a rubber raft made the most remarkable journey. He did this by drinking salt water and living off the sea. So if all sorts of mad people can safely cross the Atlantic in very unsuitable craft why couldn’t this journey be accomplished thousands of years ago? After all Stone Age people successfully navigated the Pacific Ocean in canoes, which is more than twice the size of the Atlantic Ocean. So are academics suggesting that the people of Europe and the Mediterranean Basin were far less capable of sailing across oceans in the past, than the Polynesians? It is amazing that people in living in Europe, Africa and the Middle East don’t feel insulted by such a suggestion. It is claimed that people of the past were afraid to venture too far out into the Atlantic because they believed the world was flat and were frightened they might fall off the edge. The problem is, that the Ancient Greeks were well aware that the world was round and one of their mathematicians even worked out to a reasonable accuracy the circumference of the Earth! So people of the past were not as daft and stupid as modern academics like to make them out to be. Actually there is a lot of evidence that the Phoenicians did trade in America. Ancient Greek and Roman coins have been found in America, as well as Roman pottery. Cretan, Phoenician and Celtic Inscriptions have also been found carved into rocks, and Phoenician graves have also been found. The official reaction to this is that all these finding are ‘obviously’ hoaxes. But there is one piece of evidence that is more difficult to dismiss. In 1992 in Munich a Toxicologist called Dr Svelta Balabanova did some tests on Egyptians mummies using new techniques. To her horror the results showed that there was nicotine and cocaine present in the bodies. Now as every one knows the tobacco and coca plants are only found in America and these bodies were mummified thousands of years before Columbus discovered America. She was forced to do the tests again. Samples from the bodies were sent to other laboratories, and they came up with the same result. Everyone then assumed that the bodies were contaminated in some way, but Dr Balabanova was a forensic toxicologist who had worked for the police, and knew how to overcome the contamination problem. She took hair samples, washed them clean in alcohol and then tested them. She still found traces of nicotine and cocaine within the hair that could only get there while the person was still alive. Then doubt was cast on the authenticity of the bodies themselves, with people suggesting they were Victorian fakes. So Dr Balabanova began to use her techniques on other mummies, and found the same thing. She travelled to wherever mummies were being stored and tested and found nicotine present in most of them. So she began to speculate that perhaps the ancient Egyptians grew an African species of the tobacco plant. But no one found any evidence of this, and anyway it didn't explain the cocaine also found in some of these bodies. The only explanation for this was that the ancient Egyptians were getting their tobacco and cocaine from South America. And the obvious way they were obtaining this was from the Phoenicians who were sailing to South America and trading with the American Indians, and bringing back tobacco and cocaine. Yet officially historians still won’t accept this. They claim that the Phoenicians only sailed along the coast and never out to sea, in spite of the fact it is known that the Phoenicians navigated by the stars. The only reason why any sailor would navigate by the stars is because they sail out of sight of land. Also to assume that the Phoenicians never ventured out of sight of land shows a complete ignorance of sailing. In a sailing boat the most dangerous place you can be, is within sight of land. This is because if a strong wind blows towards land you are in danger of being wrecked on shore. For that reason sailors like to keep well away from land, to give themselves ‘sea room’, if they get caught in a gale blowing towards the shore. Some more knowledgeable historians claim that what the Phoenicians did if they were caught on a lee shore in a gale was to quickly beach their boats and pull them up on the beach. Trying to beach a boat in a heavy sea is a dangerous thing to do, and it has to be remembered that the Phoenicians were traders so their boats would be laden with goods. So even if they successfully got through the heavy surf they would still find it very difficult to pull a fully loaded boat up the beach. Not only that, not all coasts have beaches; on a rocky shore they wouldn’t stand a chance. So hugging the coast wouldn’t be an option. The Phoenicians, to be a successful seafaring nation, would have to be able to sail and navigate out of sight of land. This means their boats would have had the capability to sail to America. The only reason why we don’t read about this in history is that the Phoenicians were basically traders and not conquerors. They preferred to trade with the American Natives, and they preferred to keep their knowledge secret, as they didn’t want other nations doing the same and competing with them. This was a completely different attitude to Columbus and those who followed him. Columbus was simply the vanguard of the conquistadors who were more interested in conquest and looting, than trade. If the Phoenicians did trade with America when did this trade start? There is good reason to believe that it may have started back in pre-historic times. In Neolithic age sites archaeologists have found two types of boats; dugout canoes and skin-boats. The latter are boats with a wooden frame and are covered with either animal skins or oil soaked cloth. At first glance it was assumed that such boats would be too flimsy to be used at sea, but when modern people built some of these boats and use them on the ocean they discovered they were very seaworthy vessels. 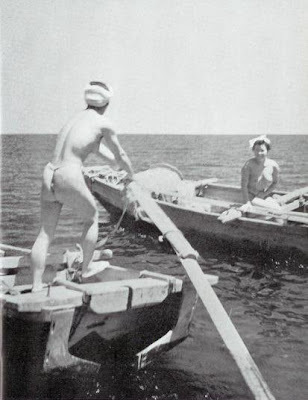 What modern experimenters discovered was that these skin boats were much lighter than either dugout canoes or later planked boats, and therefore more able to ride over high waves. Also these boats were more flexible in heavy seas, which gave them an advantage over planked boats that was known to come apart in heavy seas. To prove how seaworthy these craft were; Tim Severin in 1976 sailed a 36-foot sewn skin boat across the Atlantic. Proving that a skin boat could cross the Atlantic. Anyway, the Polynesians navigated the Pacific in dugout canoes so why couldn’t Europeans and Africans do the same in the Atlantic ocean? Ama diver sculling her boat out to sea. (Sculling is a form of rowing with a single oar at stern of the boat. The blade of the oar is held at an angle as it is pulled sideways and works very much like a flute of a fish or flipper of a scuba diver). So vessels capable of crossing the Atlantic were being built in Europe and the Mediterranean Basin back in the Neolithic age. Then there is the question of navigation; how could Stone-Age people navigate across the Atlantic? Well, this wasn’t a problem for the Polynesians, who were also Stone-Age people, and who successfully found their way to nearly every island in the Pacific. Also it seems the Neolithic people were very aware of the positions of the Stars. It has been assumed that Stone circles like Stonehenge were constructed for religious purposes, but they could have another purpose. The puzzle about the Stone circles found in Britain, France and Spain is that the stones line up with the stars. Knowledge of star alignments wouldn’t be of much use to people living on land, but would be a big help to people who frequently sail out of sight of land. It is known that the first circles were originally made of wood, and were used to work out the stars positions and alignments. (They have to do this all the time, because as the Sun moves through the galaxy the positions of the stars are slowly changing all the time). The problem with wood is that in time it rots away, so the Neolithic people had to make the circles out of stone to get a better understanding of how the stars were slowly changing their positions over long periods of time. This begs the question; why would ancient people want to do this? The same question can be asked of the Polynesians, why did they set out to explore the Pacific in primitive canoes? The reason could be that they were sea-people and lived in the sea. Official history teaches us that the only way man was able to cross the oceans was when ships were made large enough to carry food and water to feed the crew for a voyage of many months. The experiences of the Polynesians who used only canoes to cross the largest ocean in the world, is completely ignored. What official historians won’t discuss is the possibility of living off the ocean. For instance, the crew of the Kon-Tiki expedition discovered that the big advantage of being on a sailing raft was that they were so close to the water, that they were able to observe the marine life in the sea. What is more, they found it easy to spear fish and dolphins that were swimming under the raft. (This was in 1947 when the public was unaware of what wonderful, intelligent creatures dolphins were). The result was that the Kon-Tiki crew found it easy to feed themselves without always having to use the stored food they carried. After two months at sea; the water they carried turned foul and wasn’t drinkable. So they discovered that they could reduce their need to drink by bathing regularly in the ocean. They also collected rainwater when it rained. Thor Heyerdahl also knew it was possible to squeeze fresh water out of fish that had just been caught, but apparently the crew didn’t do this, as the water didn’t taste very good. In the heat of the tropics they found they needed to use a large amount of salt tablets. Then someone had the bright idea of mixing the salt-water of the ocean with the foul tasting fresh water they carried. They mixed 20% of seawater with the fresh water supplies and discovered to their surprise it quenched their thirst. They were later to increase this to 40%. Thor Heyerdahl explained that the Polynesians told him that their ancestors were able to drink saltwater with immunity if they also chewed coca leaves. As far as I know, no one has tested this out scientifically so there is no way of knowing if this is true. The experience of European sailors over the last thousand years or more has been totally different from this. There was no attempt to try and live off the sea, and they had a belief that you dared not try to drink saltwater. Scurvy was known to be a problem for sailors since the time of the Ancient Greeks. Back in the 17th and 18th centuries the British navy fed their sailors on salted meat and this was to prove disastrous, as it didn’t have any vitamin C in it. Scurvy became rampant on Royal Naval ships. An extreme example of this concerns Commodore George Anson and his voyage around the world in 1741. In the war of the Austrian Succession, he was ordered to take a fleet of 7 ships to raid the Spanish possessions in Pacific. The fleet sailed down to the southernmost point of South America but trying to pass Cape Horn his fleet encountered a storm so terrible, that only three of his ships made it around the Horn. (A larger Spanish fleet ordered to intercept Anson’s fleet was also caught in the same storm, which decimated the whole fleet.) In the Pacific, scurvy hit the crews of his ships so badly that two thirds died. This resulted in his having to abandon two of his ships, as there was insufficient crew to sail all three ships. After raiding a Spanish port on the South American coast he set sail across the Pacific in search of a Spanish treasure ship. He found one in the Philippines but by this time he didn’t have enough men to fully man one broadside on his ship. In spite of this, he was still able to overwhelm the Spanish Galleon and capture it. Then he was able to sail back to England as a national hero and very rich man. The irony of all this is that the ocean they sailed on was full of food, rich in vitamin C. The Polynesians didn’t have any problems with scurvy and as far as we know, the Phoenicians didn’t complain about this problem either. The reason for this might be because they were genuine sea people; they lived off the sea and therefore had a deeper knowledge of the sea than the European sailors who came later. As previously mentioned we know about the sea-people who still live in South-East Asia, but there are also sea-people who once lived in the Mediterranean. We only know about these people from their enemies. It seems that the Egyptians recorded being attacked by people from the sea in 1231 BC. The Egyptians claimed they managed to fight them off and defeat them. There is doubt about this, because the sea people went on to destroy the Hittite, Mycenaen and Mitanni kingdoms. They then came back and invaded Egypt once again in 1191 BC. Then some sort of peace deal seems to have been done. The sea people settled down in Palestine and became the Philistines we read about in the Bible. The great mystery is; who were these people and where did they come from? Like the sea-people in South East Asia they lived on boats, and had a powerful navy. It is clear they were displaced people, but who or what displaced them was unknown. They also weren’t a single people being a mixture of many different tribes. So scholars speculate they were the victims of a great famine and invaded other countries to find more food. The problem is that there is no record of this happening anywhere. There is also the problem of the way the sea people behaved. They violently attacked the rich cities and the rulers within them, but made no attempt to loot the city’s wealth. So clearly these people had different values and probably a very different social system to the people they attacked. If they were like the sea-people we find today in South East Asia then this would make sense of their behaviour. If like them they lived in boats or houses on stilts or very close the shore, this would then solve the problem about where they came from, and why they were a loose confederacy of different tribes. The Asian sea-people are also a loose grouping of different peoples. [This image was discovered on the walls of a palace in Khorsabad in Iraq, probably carved at about 700 BC. It probably shows sea people, because we have a merman in it who has a similar beard to the paddlers in the boats. There is also a winged bull with a man’s head on it in the same picture. This would be like the centaurs of ancient Greece, which probably were the first cavalry troops the Greeks encountered. The wings represent the god-like status of the image; in some ancient images we also have mermaids with wings. One country the sea-people didn’t attack was the Phoenicians. It seems later on they became the same people or were the same people. So it means the sea-people were living lives that human beings lived for probably millions of years. They were experts at living in the sea and on the coast. A strong indication of this is the fact that the Phoenicians had a monopoly on the colour purple. The only way the people of the ancient world could produce purple was through a sea snail called Murex. Unfortunately only a small amount of dye could be produced from each snail so large quantities of snails had to be harvested, from the sea floor, to dye just one garment. There are hills outside of Tyre and Sidon, both Phoenician cities, which only consist of murex shells. The result was that only very rich people could afford garments dyed purple and because of this, it became a royal colour. This suggests that the sea-people lived like haenyo and ama communities with perhaps women diving for shell-fish and seaweed and the men working on building boats and houses and even looking after the children. So they were the nymphs, sirens and mermaids of legend. They were happy to keep to themselves but perhaps rulers further inland began to interfere with their way of life. Perhaps one king decided to drive the sea-people away from the shore where he ruled and other rulers decided to follow suit. The individual tribes were not strong enough to resist but as they were herded down the coast they met with other sea-people tribes also being displaced until they found they had a big enough army to fight back. They then became strong enough to destroy the Hittite, Mycenaen and Mitanni kingdoms and gave the Egyptians a tough time.This suggests that the sea-people lived like haenyo and ama communities with perhaps women diving for shell-fish and seaweed and the men working on building boats and houses and even looking after the children. So they were the nymphs, sirens and mermaids of legend. They were happy to keep to themselves but perhaps rulers further inland began to interfere with their way of life. Perhaps one king decided to drive the sea-people away from the shore where he ruled and other rulers decided to follow suit. After being attacked it seems the sea people joined forces and formed a powerful confederacy, and became the Phoenicians, which allowed them to continue to live their lives without interference for a few more hundred years. Then the Persian king, Cyrus the Great, conquered Phoenicia in 538 BC. Phoenicia then became part of the Persian Empire and declined in power and influence. When Alexander the Great overthrew the Persian Empire the Phoenician culture disappeared completely. However, the sea-people on the North African coast called the Carthaginians continued to flourish. Carthage became a major power and took over from Phoenicia as the major sea power in the Mediterranean Sea. Unfortunately they become rivals to Rome and had three wars with them. The Carthaginian general Hannibal invaded Rome and successfully defeated the Roman army, but he held back taking the city of Rome itself. This gave Rome time to recover and he was finally defeated defending Carthage. The whole Carthaginian Empire then came under Roman control. It seems that the sea-people continued to live along the Atlantic European coast, as we can see from the many mermaid stories that continue to arise from that area up until the 19th century. But with the defeat of both the Phoenicians and the Carthaginians, the power of the sea-people was destroyed and the people who began to dominate the sea were no longer the sea-people themselves. The Romans clearly learnt from the Carthaginians how to build ships and may have even traded with Native Americas. (Roman coins and artefacts have been discovered in America). Yet it seems they weren’t as confident on the sea as the Carthaginians as the knowledge of how to live on the sea was forgotten. It was only in the 20th century that some of this lost knowledge began to be recovered through the efforts of Thor Heyerdahl and a Frenchman called Dr Alain Bombard, who demonstrated that it was possible to live off the ocean. He was concerned about the plight of shipwrecked sailors, and managed to sail across the Atlantic Ocean in a rubber raft without carrying food and water with him.